Updates the polygon data to match the parameters. Adds a polygon to the layer. Clears out any polygon data. References SET_INTERPOLATION_DEFAULTS, SET_STATIC_DEFAULTS, and sync(). 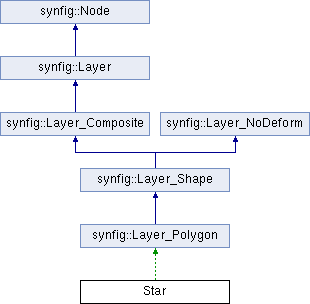 References synfig::Layer_Polygon::add_polygon(), synfig::Layer_Polygon::clear(), synfig::ValueBase::get(), and synfig::Layer_Polygon::upload_polygon(). Referenced by set_param(), and Star(). References synfig::ValueBase::get(), IMPORT_VALUE, IMPORT_VALUE_PLUS, synfig::ValueBase::set(), and set_param(). References EXPORT_NAME, EXPORT_VALUE, and EXPORT_VERSION.